President Morton Schapiro celebrates Professor Sir Fraser Stoddart and his research team for earning a Nobel Prize in chemistry. Northwestern head football coach Pat Fitzgerald captured the mood of the Friday night homecoming pep rally, speaking in front of hundreds of students, faculty and alumni who gathered on Deering Meadow after the homecoming parade made its way down Sheridan. The Northwestern University Marching Band (NUMB) kicked the parade off at Sheridan and Lincoln at 6 pm, playing “Go, U Northwestern” to the delight of the alumni lining the parade route, many of whom still remembered its lyrics, decades after graduating from Northwestern. Following the band in the procession were the 2016 Nobel Prize winner in chemistry Sir Fraser Stoddart and his team; Morty, who donned a purple foam claw; and Grand Marshall George Newbern, known for his role as Charlie on ABC’s hit drama Scandal. Fraternities, sororities and residential colleges decorated bedsheets and pickup trucks, spreading enthusiasm on the parade route. Four high school marching bands kept the music going, along with NUMBalumni, a group of alumni who came together to recreate the marching band music which helped color their college years. The parade wrapped up at the Arch, and spectators made their way to Deering Meadow. The marching band assembled in front of a stage, playing pop hits as the audience awaited speeches from Morty, Fitz and the crowning of the Homecoming King and Queen. Friedmann then returned to the stage, introducing the homecoming court and welcoming George Newbern to the stage to talk about his Northwestern experience and crown the 2016 Homecoming King and Queen: SESP senior Evan Frost and psychology major and Weinberg senior Gauri Rangrass. The night concluded with a rendition of the Alma Mater played by the marching band, leading many in the audience to lock arms and sway side-to-side, tears in their eyes as they sang. 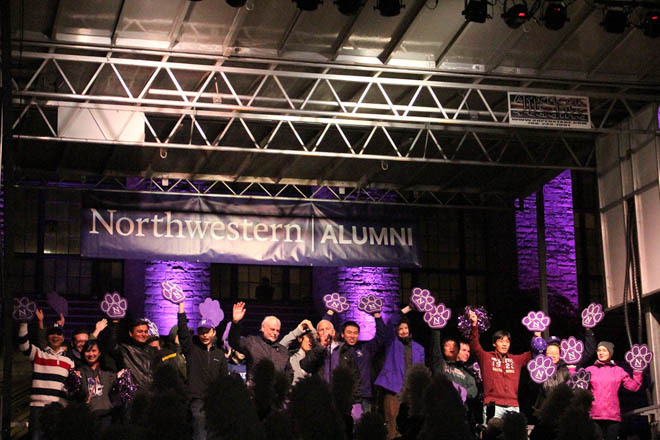 For many alumni, returning to Northwestern is an emotional, nostalgic, and joyful experience. Dr. John Lipka returns to his Alma Mater every year for homecoming weekend, and has for the past 33 years since he graduated in 1983. Now a surgeon in Louisiana, Lipka remembers his time at Northwestern fondly, and sees what an amazing effect NU has on those who get to experience what it is like to be a Wildcat.